"All this anger, man… It just begets greater anger." Fox Searchlight has revealed an official trailer for the new dark comedy from filmmaker Martin McDonagh, of the movies In Bruges and Seven Psychopaths previously. The title is Three Billboards Outside Ebbing, Missouri, which is quite an impressive title for a film, but I like it because it is so unique. 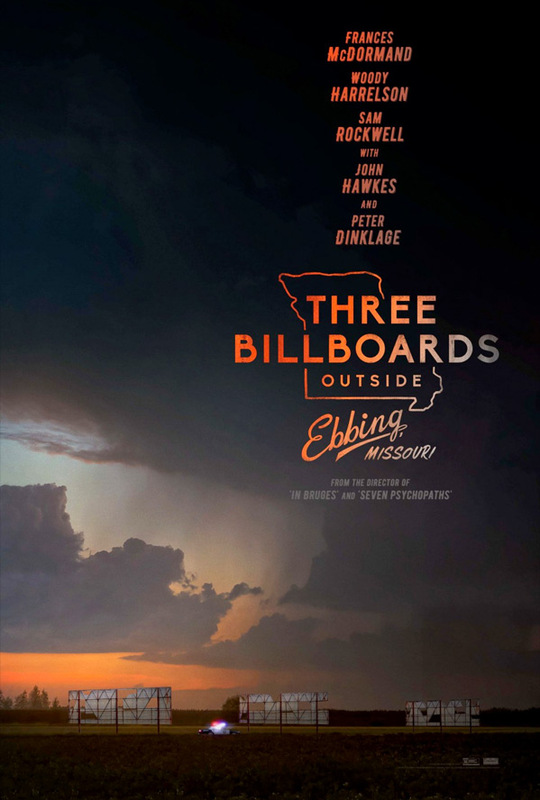 The film is about exactly what the title says - three billboards outside of the town of Ebbing, Missouri that are purchased by a local resident who is upset about a lack of any progress from the police to discover who murdered her daughter. Frances McDormand stars as the woman at the center of it all, and the exceptional ensemble cast also includes Sam Rockwell, Woody Harrelson, Abbie Cornish, Kathryn Newton, Peter Dinklage, John Hawkes, and Lucas Hedges. This seems like it's going to be such an outstanding film, perhaps a big sleeper hit if it's as good as it looks. After months have passed without a culprit in her daughter's murder case, Mildred Hayes (Frances McDormand) makes a bold move, painting three signs leading into her town with a controversial message directed at William Willoughby (Woody Harrelson), the town's revered chief of police. When his second-in-command Officer Dixon (Sam Rockwell), an immature mother's boy with a penchant for violence, gets involved, the battle between Mildred and Ebbing's law enforcement is only exacerbated. Three Billboards Outside Ebbing, Missouri is both written and directed by British filmmaker Martin McDonagh, of the films In Bruges and Seven Psychopaths previously. This is rumored to premiere at the Cannes Film Festival this summer. Fox Searchlight will then release McDonagh's Three Billboards Outside Ebbing, Missouri sometime in 2017, but an exact date has not been announced yet. Stay tuned for updates. First impression?